Adult Japanese beetles emerge from the soil in late spring or early summer. This is the stage when they are causing visible damage in your garden. Hard-bodied insects like the Japanese Beetle are tough to kill. 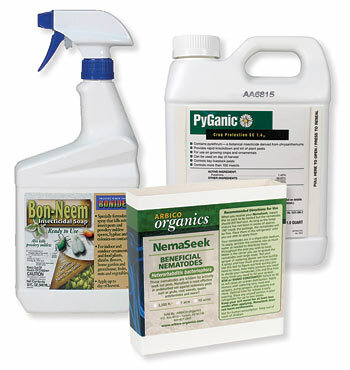 Using a combination of Bon-Neem insecticidal soap and pyrethrin such as Pyganic will act as a one-two punch to kill the beetle. The insecticidal soap penetrates their shell enough to weaken and dehydrate the insect allowing the pyrethrin to be absorbed by the insect, killing it. 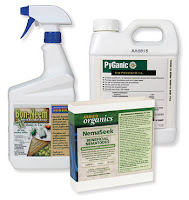 These products are natural and can be used on all types of plants and crops. During the summer feeding period, the adult females burrow 3 inches into the soil, lay a few eggs and then repeat this process throughout the summer. A single female will lay 40 to 60 eggs annually. The eggs develop into larva (the grub stage) as the temperatures begin to cool in September and October. As temperatures continue to cool, the grubs move deeper into the soil to survive the winter temperatures. The Japanese beetle spends about 10 months of the year as larvae in the soil. In spring, the grubs begin to move up through the soil toward the warming air – this is when the grubs voraciously feed on the roots of plants and turf. This is the time to use beneficial nematodes (the variety Heterorhabditis bacteriaphora) and Milky Spore (Bacillus popillae) to kill the grubs and reduce adult emergence. Spring and late summer use in-soil controls: NemaSeek Beneficial Nematodes (Heterorhabditis bacteriaphora) and Milky Spore (Bacillus popillae). During the summer for adult beetles use Bon-Neem insecticidal soap and Pyganic pyrethrin knockdown spray. The USDA has published a great handbook for managing the Japanese Beetle. The handbook is available in a printable version online for your use. Here is the link to the handbook: Managing the Japanese Beetle: A Homeowner’s Handbook. 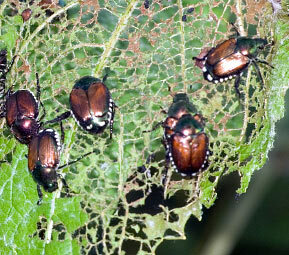 Learn more about natural ways to control Japanese Beetles.